Fort McMurray First Aid is a St Mark James training affiliate that offers quality first aid certification at flexible schedules and affordable rates. Students can enroll in full courses, stand-alone classes, private classes, and recertification programs. Getting certification from St Mark James has never been this easy until Fort McMurray First Aid. Prospective students can sign up for a training program through the registration form on the Fort McMurray First Aid website. The website also has a complete list of available classes, rates, and schedules. Other ways to enroll include e-mails, telephone calls, or walk-ins during business hours in any of the facilities in Alberta. Course fees are very affordable with Fort McMurray First Aid. Fees are inclusive of taxes, certification, and training manuals. These are paid in full during enrolment so trainees don’t have to worry about additional expenses during the training period. Full refunds are given to trainees who drop out, as long as a 72-hour notice is done beforehand. Giving water for heat exhaustion. Standard first aid training in Fort McMurray First Aid covers different topics focusing on the emergency medical services (EMS) system. Students learn how to treat or perform wound care on different injuries. CPR/AED training and how to recognize situations that compromise circulation and oxygenation are also taught during first aid courses. 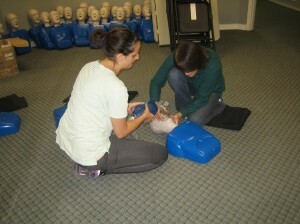 The entire standard first aid course lasts 14-16 hours. Students who just want to take cardiopulmonary resuscitation (CPR) and automated external defibrillation (AED) training can enroll in a stand-alone class. AEDs are machines that supply the heart with needed shock through pads on the chest. This program is available in three levels: A, C, and HCP, lasting four, five, and six hours long. Certificate cards are awarded to students once they pass the program. To pass, the student is required to have complete attendance, at least 75 percent on the written exam, at good return demonstration of skills. Wall-mount certificates can be requested. The certificates are valid for three years and can be renewed through recertification programs. Recertification for standard first aid lasts 8 hours and includes CPR level C or HCP recertification. Private instructors are available with hourly rates are available at Fort McMurray First Aid. They can be booked for training at home or for special events like company conferences. Just send an e-mail or give a call to inquire about private classes. The medical term for a heart attack is a myocardial infarction. This happens when the heart tissue and muscle (the myocardium) isn’t receiving enough blood and oxygen causing the tissue to die (infarction). This can be caused by fatty deposits in the artery that cause it to become blocked, halting the blood flow. A leak from a damaged vessel can also cause poor blood and oxygen flow to the heart. Chest pain lasts for more than 15 minutes and is not relieved by rest and medication. Only morphine sulfate can relieve the pain of a heart attack.